Logic dictates that every Holga should produce pretty much the same outcome. But then, logic and Holga don’t mix – so I went and shot a few rolls on my Yellow Holga. Maybe he’s the lucky one to win a trip to the land of beach huts in July…? Coloured Holgas not only look super funky, they also make it easy to distinguish what you’re doing with them. 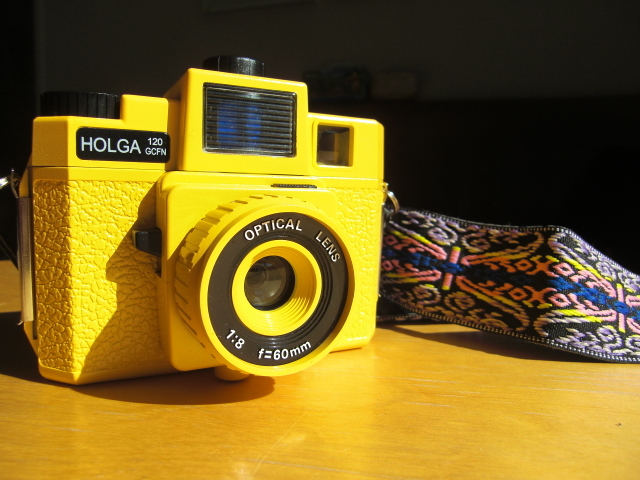 I tend to use the Yellow Holga primarily for 35mm, with or without dedicated gate. Multiple Holgas in your arsenal also means you can have more than one film on the go: You could have one for black and white, and one for colour neg. Or you could have two different films both on standby in different Holgas, so you don’t have to finish a roll first. It’s also a great way to have several Holgas loaded, if you have to take plenty of shots quickly and don’t have time to reload your little friend. I found shooting a roll of panoramas takes about one minute, but unloading and reloading your Holga takes about 3 – which means you might miss what you actually want to shoot. Use the time you’re sitting in a cafe, or when the sun’s hiding behind that annoying cloud instead. For this test, I’ve used Kodak Ektachrome EPP 100 (yellow being the Kodak colour – easy to remember). It was a fairly sunny day, with occasional cloud cover. It was enough to see if the expired EPP was still up to the challenge, and to see how Yellow Holga handles panoramas. I’m pleased from this as much as my other Holgas, apart from the harsh overlaps. Only the magic Pink Holga seems to blend images well so far – maybe we’ll find out why later in the series. So the question remains: Which of my Pastic Fantastic Cameras will win a trip to Miami, and travel the beach with sunshine, sand and the ocean?